ForeverWood is a non-aqueous, environmentally friendly, one time-lifetime, wood treatment solution for dry, wet or green wood media. ForeverWood is a wood stabilizing penetrant, not a coating, designed to waterproof the wood from the inside out. Application of this dynamic product triggers the early stages of wood petrifaction, stopping expansion and contraction of the wood, thereby eliminating splitting, checking, cupping and fastener rejection, leaving behind wood surfaces that are safe for kids and pets, surfaces that paints and stains will adhere to perpetually. ForeverWood comes ready to use, do not dilute. ForeverWood is a natural, solvent - silane - cold pressed neem oil treatment, a non-aqueous penetrant that removes moisture from wood. Eliminate expansion and contraction that causes wood to warp, cup and split. Get long lasting water, insect and decay wood protection with ForeverWood. Protect your investment with long lasting and natural wood treatment protection. Discover ForeverWood, a breakthrough in wood treatment technology. Finally a 100% natural wood treatment product perfect for use in the construction of raised gardening beds. If you’re looking for a wood treatment alternative for the deck or garden, natural ForeverWood is an excellent exterior wood sealer and eco friendly wood deck sealant and wood waterproofer! Perfect for deck, dock, fence, barn or log cabin. Use this product to wood treat utility poles, pilings and fence posts too. Use ForeverWood for exterior or interior wood sealing projects. ForeverWood is a superior exterior wood primer and pre-stain wood conditioner! Before You Paint or Stain, waterproof the wood from the inside out. Our environmentally friendly natural wood treatment products combine water scavenging penetrants that stabilize the wood forever with an natural termiticide, mildicide and waterproofer all in one treatment. All woods and bamboo contains two different forms of moisture. They are referred to as "FREE WATER and BOUND WATER. Free water harbors in the fiber structure of the wood. Bound water is found in the Hydroxyl molecule that is the sole make up of cellular compounds. A hydroxyl molecule has two tails. A hydrogen tail and a oxygen tail. The uptake of these two compounds creates H20 or water. Expansion and contraction of wood is created when the hydroxyl molecules take on more or less airborne or liquid moisture. Treating an Older Deck? Clean it First. Perhaps you’ve had your deck, fence or other wood structure for some time and it’s now showing the natural wear and tear from the elements. Rest assured that applying ForeverWood, even to older wood structures, will halt further deterioration and pump new life into the wood. ForeverWood is a solvent-silane-cold pressed neem oil treatment. Solvents will instantly displace free water from the fiber structure of wood; Certain silanes used in the ForeverWood formulation are water scavengers. Since they are of extremely low molecular weight they are capable of penetrating the cell wall structure of the molecule and attacking the water inside the molecule. The water is then replaced with a Si-Jel Matrix, a pliable silicone compound made up of silicone and cold pressed neem oil. This phenomenon is created by a catalytic conversion that uses the bound water to trigger a hydrophobic reaction inside the hydroxyl molecule. The un-utilized and excess water is then released and exits the wood in the form of ethanol gas. Additionally, the other components of the formulation are synergists allowing the solution to bond with the water and subsequently waterproofs the wood from the inside out. The cold pressed neem oil in ForeverWood offers natural and non-toxic termiticidal, fungicidal, mildicidal and antibacterial properties to further protect the wood from borer insects including termites. Additionally, cold press neem oil performs as an excellent residual inhibitor of both brown and white-rot fungi growth. First, waterproof the wood from the inside out, then paints and stains will last perpetually. Protect the beauty and charm that wood structures bring to our premises from termites, parasites, wood rotting fungi and the punishing effects of time, temperature variation and weather. A one time, life time treatment of ForeverWood will bring on the first stages of wood petrifaction. This inexpensive, natural treatment will preserve and extend the life of decks, docks, fences, gazebos, trellises, swing sets, guardrails, barns and log homes or any wooden structure that adds utility and value to our property. Now homeowners can protect these wood structures from the punishing effects of hot sun, Ice, snow and temperature fluctuation with ForeverWood. 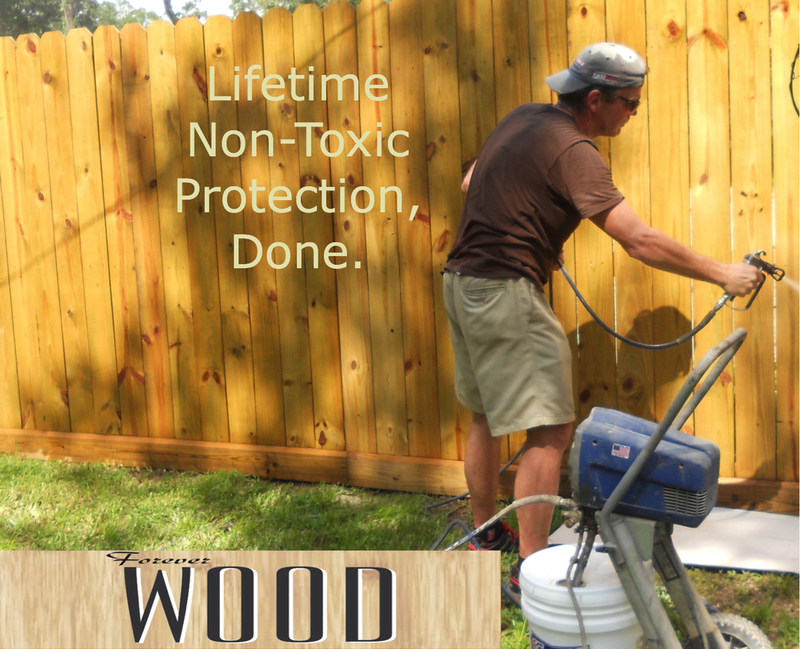 ForeverWood is non-aqueous wood stabilizer that offers homeowners a one time, lifetime wood treatment solution. Once you have treated your deck, fence, dock, barn, wood furniture of log cabin with ForeverWood, the wood media is entirely moisture free. Now it’s time to add a favorite stain, or paint color. Paints, stains or glaze will now last far, far longer since without moisture inside the wood, the natural expansion and contraction that causes paint to crack and chip off had been arrested. Our newly released KreteSeal Concentrated Wood Sealer makes an excellent companion product to apply after ForeverWood treating. KreteSeal will lay down clear and provide a sharp and shiny finishing touch to any wood project. KreteSeal offers both enduring strength and a subtle gloss coating to the wood. Looks great on top of any stain or paint you choose. Learn More.